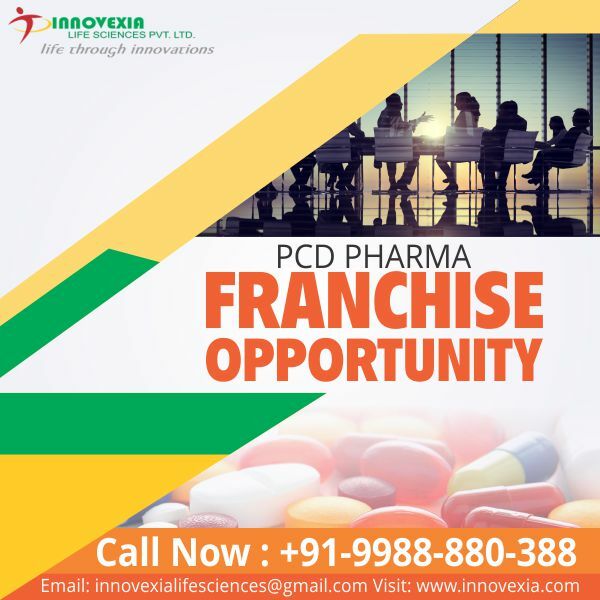 PCD Pharma Franchise in Rajasthan – Innovexia Life Sciences welcomes you. We are the top leading PCD pharma franchise company in Rajasthan that is involved in manufacturing, marketing, and trading of pharma products. The company has made its significant presence in the very short span of time. We have received ISO, WHO and GMP certified that offers the huge product range that includes more than 500 products. Under the expansion plan of the company, we are offering our PCD Pharma Franchise in Rajasthan. Pharma Franchise business is creating a lot of buzz among the pharma experts this is because of its amazing business opportunity and great growth. It has gained a lot of popularity and many are getting pharma franchise. The state government, in order to provide good access to the people of the state, is encouraging this sector. Innovexia Life sciences are well known for providing the best quality pharma products. Our PCD Pharma Franchise in Rajasthan is a great opportunity for you to get a great start in the pharma industry and own your own business. To get the pharma franchise of any location of Rajasthan, call us at +91 9988880388 or email at innovexialifesciences@gmail.com. PCD Stand for Propaganda Come Distribution in Pharma. PCD Franchise is the weights given by Pharma companies to merchants, pharma distributors or MR ( Medical Representatives ) to sell their pharma products at their own the profitable prices at the particular Area. Any small to medium company can avail good benefit out of these services who do not have access to other states or regions. Even the production ability is small, then also it is a great way to enhance their business with little investment which will be fruitful in the long run. Innovexia Life Sciences is Chandigarh based pharma franchise company ideal for Pharma Franchise/ PCD Pharma business. We are involved in the manufacturing, marketing and supply of medicine all over the country. We are among the top Pharma Franchise Companies in Rajasthan and deliver a wide range of high-quality pharmaceutical products at affordable prices. What is the Scope and growth aspect of PCD Pharma Franchise in Rajasthan? Rajasthan is a State with 74.79 million populations which is huge and when it comes to the state’s healthcare sector than it is also big. The state is having a good number of hospitals, health care centers, clinics in Rajasthan and yet for better facilities of hospitals the government is planning have more in all districts. This definitely will increase the demand for the pharma products at the affordable prices, thus the scope for the pharma franchise is good. Moreover, everyone today wants to get the best quality effective drug at affordable prices so that they get good results and the people are concern regarding their health. With the improvement in the income of the middle-class lifestyle is changing and people getting more concernment about the medical treatments. In coming years the pharma franchise business is expected to grow for as the demand will for the quality pharma products keep on increasing. The company will provide the PCD Pharma Franchise district-wise with the monopoly rights so that you get the best opportunity for the growth and the profit. We will provide the pharma franchise in the cities like these of Rajasthan: Jaipur, Udaipur, Jodhpur, Bikaner, Ajmer, Pushkar, Kota, Ranakpur etc. Collaborate with Innovexia Life Sciences and get great business opportunity to be your own boss in Rajasthan regions. We are known for delivering what we commit to our associates and ensure to work professionally and ethically in the pharmaceutical sector. Innovexia Life Sciences is a fully integrated pharma company that is involved in the manufacturing of the best quality pharma products in the authorized plants. The company is fully integrated and have the best infrastructure, machinery, and technology that support us well in providing the best quality pharma products. Our formulations are made with the best quality raw products that are supplied by the best vendor in the market. The company provides the best quality of the products with great effectiveness, purity, and safety. The company provide a huge product range and have the associates from the different parts of the country. We are the trusted name in the pharma industry and provide ethical pharma franchise. The company has a good corporate image which will benefit you in the sale. Associate with us by having our Pharma Franchise and PCD in Rajasthan for better profit and great growth in the future. All the products will be delivered on time to all the regions of Rajasthan. Innovexia Life Sciences is willing to reach out to maximum numbers of people. The Company ensures that everyone gets the opportunity to do well in all regions of Rajasthan. What are the benefits of having Our PCD Franchise in Rajasthan? There are several benefits of choosing your own pharma franchise company to start your business successfully in the pharmaceutical sector. There are several things which makes this one of the prominent sector to invest money. Best quality raw material and ingredient is used for the manufacturing of drugs. All the products are stored in the germ-free and spacious zone once the manufacturing is completed. Our pharma Franchise associates in Telangana will get the newsletter for all the latest development and new launch in the pharmaceutical sector. This your chance to be the part of top Pharma Franchise Company in Rajasthan. Collaborate with Innovexia Life Sciences and get the exclusive range of medicine with goof profit margin. Pharma distributors from Rajasthan’s all districts are invited to be our partner and start their won business with less investment. What Is The Difference Between PCD Pharma & Franchise Pharma? "We have inspiring and challenging mission to improve health of human being by enabling person to do more, feel healthy and live longer."